Absolutely Free! No Spyware! No Malware! With Photo Slideshow Maker (free version), you can create photo flash slideshows in both SWF and HTML formats for watching on computer, burn the auto-run flash photo album to gift CD/DVD, or upload the slideshows to our free web album Go2Album, and then embed the slideshows to MySpace, Blogger, Friendster and many other social websites. Add JPG, TIFF, BMP, PNG images and internet URL images; You can also edit and optimize photos through adding text, descriptions, artclips, URL links, etc. 300-plus flash templates are provided: Free Basic & Premium templates consist of elegant common templates for Sports, Holiday & Vacation, Wedding & Birthday, and even for Business Presentation. 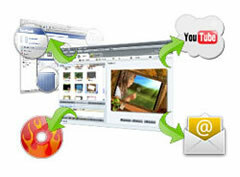 Web Album, 3D Galley, Video Gallery, HTML5 or other advanced templates are only available in Platinum version. 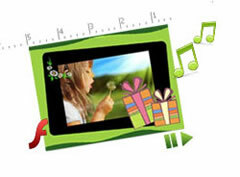 All templates in Photo Slideshow Maker Free can be customized in details. You can adjust slideshow size, background images and colors, Frame, buttons, audio sound, and so on. In Premium, there is also an amazing Template Editor built-in. You can freely create your own flash templates and make perfect slideshows in your own style. The free version of Photo Slideshow Maker turns your photos and music into a stand-alone flash movie (with the .swf extension) . You can move the Flash movie anywhere to playback, send it to friends via email, or upload to web page. Can't add DRM protected music to flash slideshows? Try NoteBurner Audio Converter. 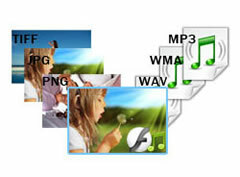 Photo Slideshow Maker supports 3 types of output options. 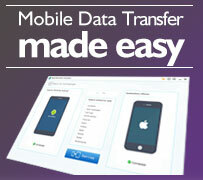 You can create standalone flash movie, which is simple to manage and share; and gift CD/DVD. The SWF file is a standalone flash movie. Basic templates generate this kind of output. Auto-plays when inserted into computer drive.